I love well-flavored and spicy foods, and this recipe, which is a modification of Emeril Lagasse’s recipe I found at GumboPages.com, is a great compliment to many dishes. This seasoning goes great on a good, sturdy piece of fish, pork, and beef. I haven’t tried it on chicken yet. My version adds a little smokey flavor to the meat. Last night, we had fantastic pastured pork steaks, which I bought from Live Springs Farm. I sprinkled a little of the seasonings on each side of the steaks and broiled them. Yum! US Wellness Meats has 4 great spice mixes. Be sure to check out the tips on their website. Use On: Every kind of meat, fish, or vegetable. Use On: Grass-fed steaks, wild-caught salmon, and chicken. Use On: Pastured pork, lamb, chicken, and wild seafood. Food.com has a great Mediterranean spice mix with some tips. Be sure to check out the tips on their website. 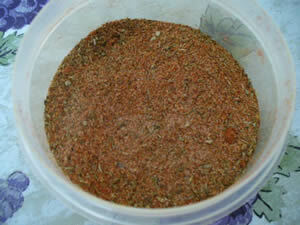 Shawarma Seasoning – check out the chicken shawarma recipe, which includes the seasoning. Mark’s Daily Apple has some great rubs. Check out the website for some tips.